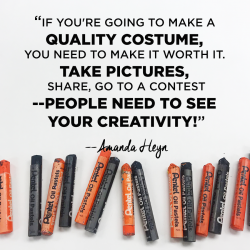 The beginning of the school year is a great time for inspiration, and who better to inspire your students than some amazing artists? 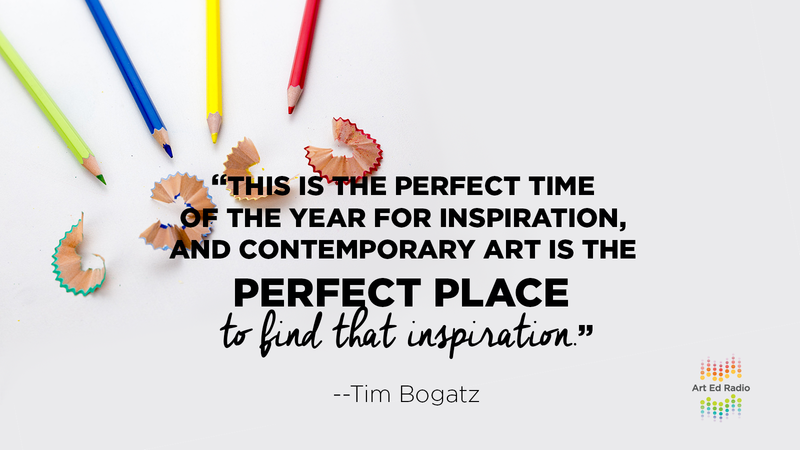 Tim and Abby get together to discuss some of their favorite topics and artists that inspire students, why positivity is so important, and how to take artists’ ideas and make them work for your own classroom. Full episode transcript below. Tim: Welcome to Art Ed Radio, the podcast for art teachers. This show is produced by The Art of Education and I’m your host, Tim Bogatz. As we are starting the new school year here, we’re doing a lot of episodes about the new year and how to start the new year right. I think that’s important because right now is the time for inspiration when you are excited to get back to school, or most of you are excited to get back to school. Kids are generally excited to be there, at least excited to be in your class, and they’re ready to get going. They’re ready to be inspired, and they’re ready to start working. Inspiration can come from a lot of different places. For me, a lot of times I like to draw inspiration from art history. This idea came about, the idea for this discussion, this podcast because Abby posted recently on Facebook about artists that are new to you, like artists that maybe other people have discovered. Maybe they’re already popular, but you’re just discovering, or ones that you’re just learning to love. I absolutely adore that idea because I love seeing people finding new artists, new work, and new methods of inspiration. It’s fascinating to see what people come up with, who they’re learning about, and mostly importantly how they are using those artists in the classroom. Abby and I are going to talk about that today, and I hope that our discussion is able to do that for you. 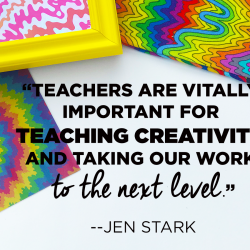 Maybe introduce you to a new artist or two, give you some ideas for the classroom, how to use these artists and use their ideas to help inspire your students. 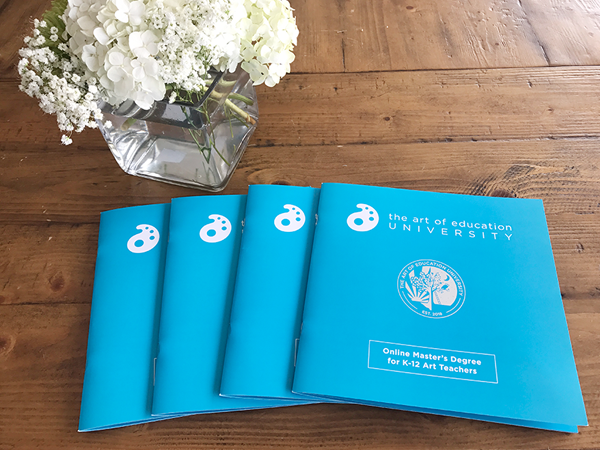 Before we start the discussion, I want to tell you about the winter Art Ed Now Conference. I know it’s weird to be talking about winter and something that’s happening in February because it is August. We’re just starting the school year, but I need to tell you about it because Thursday the 31st is actually the last day that you can sign up for $99. I’m excited because we’ve announced a few presentations already. We have Jonathan Juravich. He’s a national Teacher of the Year finalist. He was on the podcast here, and he’s going to be presenting on empathy and building relationships. Don Massey who is at just about every conference and does an amazing job, is going to be presenting with chalk pastels. We’re going to have presentations on brain breaks and street art and making community connections, and there’s just so much more coming. I’m working behind the scenes right now on getting presenters for steam ideas and sculpture projects and ceramics and analyzing art with your kids. Just so many great ideas, and as always we’re trying to find some great presenters as well. Again, just until the end of this week you can go to artednow.com and get the low price of just $99 for the conference. All right. Abby is staring at me, waiting for her turn to talk, so let’s go ahead and bring her on now. Hey, Abby Schukei is joining me now. Abby, how are you today? Abby: I’m doing fantastic. How are you, Tim? Tim: I am doing great. I’m excited to talk about artists inspiration, but before we dive in, I want to ask you. You started out this school year with all kinds of different artworks that are bringing the power of positivity into your classroom, the hashtag be kind thing that’s going on all around our city of Omaha. If I can just ask you, why do you think these ideas are so important? Abby: Well, you mentioned this hashtag be kind thing. Just a little background information for listeners. My school district has adopted this philosophy for the last few years, and it’s just kind of become an initiative where we … I have a conversation with my students, and one of things we always say is we just talk about being kind to one another. That’s really influenced a lot of my thinking in ways that I introduce some things to my students. Starting off the school year, I definitely used a lot of this positive kindness in the art room because the art room is one of the best places that you can do that in. I did write an article about one of the projects that I did that was a tie-in with street art and stencil design and just simply using spray chalk to go around and create positive messages around the school campus. That was something that really had a great response. I always talk with my students about what makes you feel better when you’re having a bad day. I always challenge my students too as they exit my classroom is to talk to someone different, or go out of your way to do something that maybe you wouldn’t do just to be kind to one another. I think in our day and age of schools, it’s really hard. It’s hard to be a teacher sometimes when we have students with mental health issues, and we don’t know how to handle those things. By bringing positivity and this philosophy of kindness into the classroom, and through making art hopefully it can make a little bit of a difference. Tim: Yeah, I think that’s really well said. As much as I’d like to be able to do that all the time, sometimes we need to just find artists that inspire us in other ways too, not necessarily for these huge important idea. I wish we could do that all the time, sometimes, we’re just teaching art as well. I also want to talk about artists that just inspire us in other ways. We’ve each put together a little bit of a list of some of our favorite artists that either inspire us or more importantly inspire our kids in different ways. If we can just go through those, and share who we like and why we like them. Can I go first? Abby: Yeah, sure. Sure, Tim. Tim: Okay. It is my podcast after all. Abby: Sure, it’s all about you. Fine. Tim: I wanted to just do one that my kids are always fascinated by, op art and optical illusion, so artist number one for me is Bridget Riley. She does just amazing stuff with black and white artwork. She does do some color stuff too, but her black and white stuff is amazing. Just talking about optical illusion and visual perception, and if you really want to get into the science behind all of that, she is an awesome artist for all things op art and really introducing that to your kids. I also like Yaacov Agam when it comes to op art, but Bridget Riley is definitely my go-to there. Do you like Bridget Riley? Do you teach optical illusion? Abby: It takes a lot of time for students to construct things. I’ve been kind of doing it more in my digital art classes, which have been pretty fun. The last one that we did was like, we did an optical illusion where it looks … They design it, but then we actually printed it out and set it along on tables and stuff, and it looks like a hole, for real. Those are the ways I like to incorporate it a little bit. Tim: Okay, cool. Now, who’s artist number one for you? Abby: Okay. Artist number one is Kristin Farr who is a contemporary artist who focuses a lot on … Well, her work is inspired by Pennsylvania Dutch folk art. Tim: Okay. That doesn’t sound very exciting. Abby: No, it doesn’t. When you’re talking about … I always show my students barn quilts. Abby: That’s kind of what it comes from. Her work is inspired by that, but it’s not like that, but it is very geometric with design, and so it’s a really great way to introduce the ruler to your science, because if they don’t use the ruler, their design is going to be totally off. Even with my eighth grade students, they just don’t know how to measure things, and so it’s a really good way to get them thinking about symmetry design, using math concepts. I mean, there is actually a lot of geometry when I talk about Kristin Farr, but her work is so colorful, and I know that we might have, you know. Do you we make color wheels in the classroom? We do not? I’m not sure, but I do know that color mixing is really important, and she’s a greatly great artist to incorporate color theory, color mixing. A lot of her color designs are made in such a way that they are just so brilliant. She focuses a lot on the relationships of colors. It’s super cool that way, and it’s kind of a more modern way. It’s 2018, you know. 2018 way of creating a color wheel if you will. 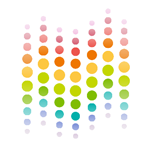 That’s a super good one if you are looking for an exciting way to teach color. Tim: Yeah, I think that kind of goes the whole point that I always taught. You know how much I hate perspective drawing and how much I hate color wheels, but I think the whole point that I’m trying to get at is that there are better ways to do things, and Kristin Farr is a great example of a better way to do that. Because like you said, it’s not a traditional boring color wheel where you fill in 12 different circles. You have this dynamic, exciting way to show how colors mix, how colors blend, how they relate to each other, and I think that’s just a much better way to teach them. Moving on to my next artist. Somebody that got me thinking when you were talking about precision and repetition and things like that with Kristin’s work, is Tara Donovan. I don’t know if you know her or not. Abby: Yeah, a little bit. Tim: Yeah, she’s creates these amazing sculptures. Basically she’ll take just every day objects, Styrofoam cups or drinking straws or tooth picks or Scotch tape, and actually make these giant installations just using hundreds or thousands of these materials. She actually has one that used one million index cards. Tim: She turns them into these really intense, really repetitive sculptures. They almost turn into these organic materials like this organic subject matter. Anytime that I’m talking to kids about repetition, particularly when we were teaching sculpture, I love showing her work. Like I said, it’s really interesting because it is just like these boring everyday materials, but then she absolutely transforms them into these giant room-size sculptures that just really blow my mind. I mean, they’re really intense and I really, really enjoy them. What about you? Do you have any sculptures that interest you? Abby: Yeah, I do. Going along the same lines of those everyday objects, I love the work by Tom Friedman. He mostly works with sculpture. One of the things that I really like about using him in the classroom is that he does a lot of conceptual art, which can be really difficult for students to understand, but I think he does a good job. His work is … He does a good job of allowing students to understand that a little bit. I’ve talked about conceptual art with my eighth grade students before and they’re just like, “Uh, what? What did you just say to me?” Let me give you an example. He’s using those everyday found objects. A lot of his later work or his past work, there’s one of them that it’s a sculpture of cardboard boxes, like cereal boxes, and just things that he would eat. They were all just the corners of the boxes over a year’s time. It was kind of showing this is all the products, or this is what I have eaten or whatever over a year’s time. It’s a different way to … A lot of this work is focusing on just being reflective on you as a person, environmentally conscious. A lot of the time he incorporates a lot of child-like humor into his work, which is super relatable to students, and they actually can grasp it and understand it. One my student’s favorite sculptures is the giant hamburger made of Styrofoam. He’s just a really good one that I think does not … It’s a good way to introduce conceptual art because it doesn’t go over your student’s head, but it can be really fun and enjoyable, and can really get students to reflect and give them a frame of reference for maybe diving deeper into some of their own work. Abby: Yeah, I don’t know her. Tim: Okay, well, you need to look her up. Abby: I’m Googling it right now. Abby: Yeah. Okay, so I just did a great Google search. Tim: What’s your first impression of looking at her? Abby: They’re so interesting. I can’t … Like you click on one, and you I can’t look at it because there’s so much stuff going on. It kind of reminds me of surrealism meets fairy tale meets Renaissance. Tim: That’s a good example, yeah. That’s a really good description. Abby: I don’t know. There’s lots of architecture in there, windows, yeah. Tim: A very soft painterly style with most of her stuff, even if it is this strange creature like eating breakfast at a table. Abby: Yeah, I feel like this could be the book cover for The Canterbury Tales maybe. Tim: That’s good. All right. Who’s next on your list? Abby: My next one is CJ Hendry, and she’s an Australian contemporary artist who focuses on drawing. She uses a lot of colored pencils, and some of her past work is done with just ink on paper. One of the reason why I was really drawn to her work is because we talked about this before on the podcast, but I hate teaching drawing. Her work, she’s so very hyper-realistic, and so kids see it and they’re like, “That’s not a photo?” You’re like, “No. You can learn to draw like that too.” They’re all relatable objects too like Lego men and things like that. One of my favorite things that I’ve come across. She recently did this exhibit that’s called monochrome. That is just monochromatic colors, so she had these different rooms, whereas like an all yellow room, an all blue room. Abby: In each side of those rooms, all the objects inside of that were the matching color, but then her drawings on the wall, and these drawings are massive. They’re huge. She had these crumpled up Pantone chips cards, and just had the drawings of the Pantones that matched the color of the room, but the drawings are incredible. One of the ways that I’ve been using her work in my classroom is she has this other series where she would look at paint on a pallette and just the glop of paint, excuse me, and she would have … What I’ve been having students do is we’ve been mixing together this pretty swatch of paint, so it’s goopy, there’s texture, and then we take a photo of it. Student then use that photo. We do a little series where they are first just looking at value, just using regular drawing pencils, and then eventually we go into colored pencils. Abby: It’s just a really small way to teach those drawing concepts of value in a more interesting way. Students are super into it because they can really see how the colors are mixing together, which makes sense when you’re teaching colored pencils. It’s kind of discovering her as an artist, has kind of made me hate teaching drawing less. Tim: Okay. Good. I thought you were going to say even more. Abby: No. Less, because I feel like I’m onto something here. Yeah. Tim: I’m just looking up her stuff for the first time like you just did with Remedios Varo. Tim: It’s amazing. I love her stuff. It reminds me a lot of two of my favorite artists that I use for drawing, Kent Bellows and Robert Longo. Both of those guys do these hyper-realistic drawings. She’s kind of in that same vein, but she takes it a little further, and I love these huge paint swatches that she has drawn. When you first look at it and I thought it was just giant globs of paint on the wall, which is cool, but then you see her like, it’s actually an eight-foot drawing of a paint swatch. It’s really, really interesting. I’m kind of fascinated. I want to look her up more, which hopefully I guess is the point here. We’ll put links on the page for you guys so you can check out all of these artists, and maybe even bring some ideas into your classroom and hate drawing a little bit less. Abby: Yeah, that’s the goal. Tim: All right, cool. Thank you, Abby. Okay. We will post links to all of these artists that we talked about today and their websites or Instagrams or whatever accounts where you can discover them and see what their work is all about. I think it’s a lot of fun to share the people and the artists that we love. I just introduced Abby to Remedios Varo, and she introduced me to CJ Hendry, and immediately for both of us the wheels start turning. You start thinking about how our kids are going to respond to this. How can I use this in my lessons? How can I use this to show kids what’s out there and inspire them? I think that’s a wonderful thing. Check out these artists, and if you’re so inclined, maybe listen to some old episodes where Andrew and I are introducing different artists and talking about how we bring their work into the classroom. 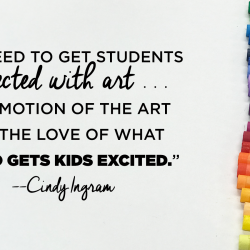 Hopefully we have gotten your wheels turning as well, and hopefully you’re going to be looking up some of these artists, and thinking about how to bring them into your classroom. It’s the beginning of the year. It is a great time for you to be inspired and a perfect time to inspire your kids as well. Art Ed Radio is produced by the Art of Education with audio engineering from Michael Crocker. Thank you for listening as always. Go sign up for the Winter Conference. Website is artednow.com, because you have exactly two more days to get that $99 price. I promise you it will be worth it, so go sign up and we will see you for the conference on February 2nd. Talk to you next week.